There’s something very intimidating about cooking ‘real food’ for a large group of people, especially if you’re on a budget. Shoot, some days I feel like I can barely get food prepared to feed my family, so to feed a crowd means exponentially more time. And then there’s the idea of wanting to have food ready for the party without doing a lot of prep as the guests arrive, since I’m always behind and time challenged! I’m always on the lookout for simple party food ideas that people will enjoy. I served a pasta salad bar for my daughter’s First Communion party this spring, and it was a huge hit. I provided pasta (regular and gluten-free), lettuce for salad if anyone was grain-free, a few homemade salad dressings and a huge number of toppings, and people could make their own flavors as they chose. We had homemade rolls and sliced turkey as well for “sliders” and it was just perfect. A few guests complimented me on the fact that everything was ready to serve when we all walked in together after Mass and that I made it look easy. As someone who is always running around like a chicken with her head cut off, that was a huge accomplishment for me, so I knew I needed to share this system with you all! When I’m making a pasta salad to go for a party, another reason I love it is because I can usually make one with ingredients I have on hand. For the pasta salad bar, I just used ALL the things! You could easily add meat to make it the centerpiece of the meal, but we had the turkey sliders for this one. We offered both wheat and gluten-free pastas. Choose curly pasta if you can, anything with lots of texture, so that the dressing has lots of surface area to stick to. Also, if you’re not a fan of pasta for health reasons – it’s a more processed food than we usually eat – you could totally do a “cold grain salad bar” with cooked rice, quinoa, spelt, etc. (like this salad). I also had made Pinch of Yum’s Magic Green Sauce (SO delish!) and when we had leftovers for dinner the next night, I made a pasta salad with it. HIGHLY recommend trying that! Cut everything in advance. 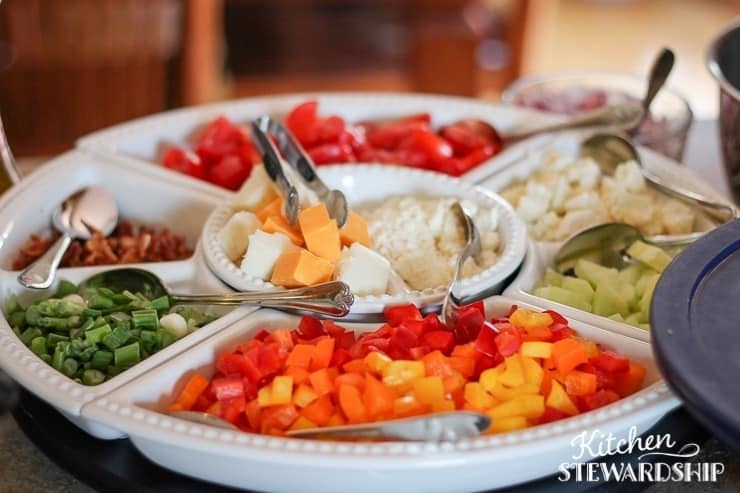 Most of the toppings can be prepped a day or more ahead of time, so make a list and check it off well before the party! Cook the pasta the day before. No matter how you store it, add some olive oil to keep it from all sticking together. Plan out all your bowls. I had little labels for most things, so I just put them in the empty serving bowls and then party guests who asked, “What can I do to help?” could actually easily help out! Put out all the serving utensils in advance as well. If people are helping, tell them a good place to stash any bowls or bags that held all the toppings so that you can put them all away at the end of the party – and hopefully you’ll have delicious leftovers for the next few days! But I Just Want an Easy Pasta Salad Recipe!! What happens when a recipe is not a recipe? No, that’s not just a bad joke, although I’m pretty famous for those sort of knee-slappers. It’s just that some “recipes” are so fluid and adaptable, they’re more like a set of general suggestions, or a chart you can fill in with your favorite options. I call them “framework” recipes, and I think they’re fabulous. With most soups, skillet dishes, and even some casseroles, I switch things up a lot. 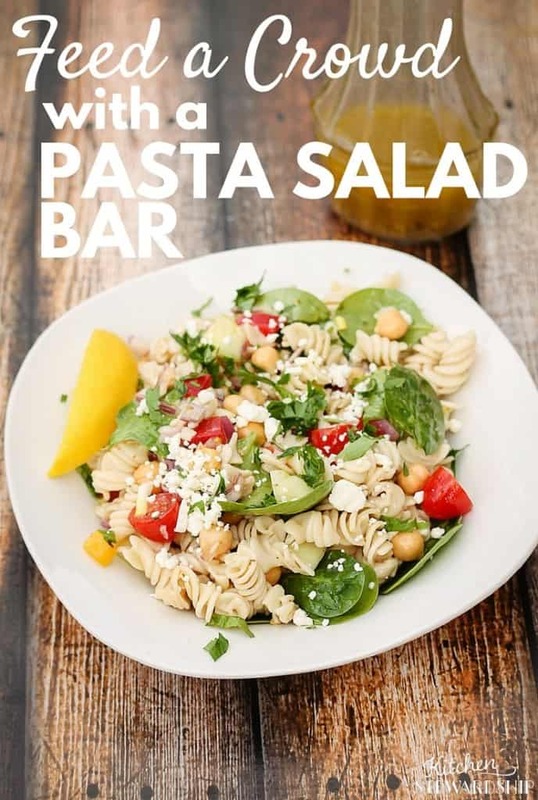 Pasta salad is a great example of an open-ended recipe that can even be a great fit for a party or potluck without a special run to the store. 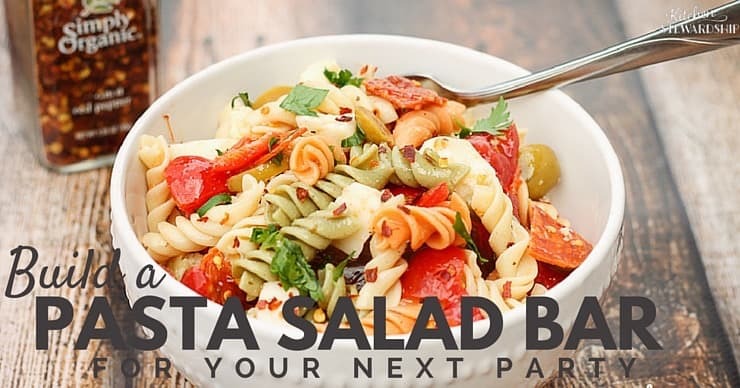 No matter what you have on hand, you can make a good pasta salad to share! Note: when packing to take to a party, bring extra dressing to add when you get there. A dry pasta salad is a sad pasta salad! 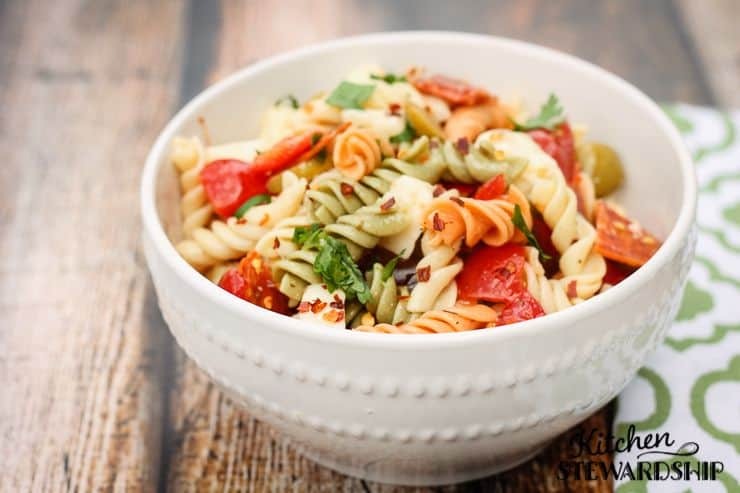 Here’s a classy and simple Tomato Basil Pasta Salad that uses fettuccine noodles. Feel free to omit any ingredient and add others (except maybe the pasta…although you could do this with any whole, cooked grain too). 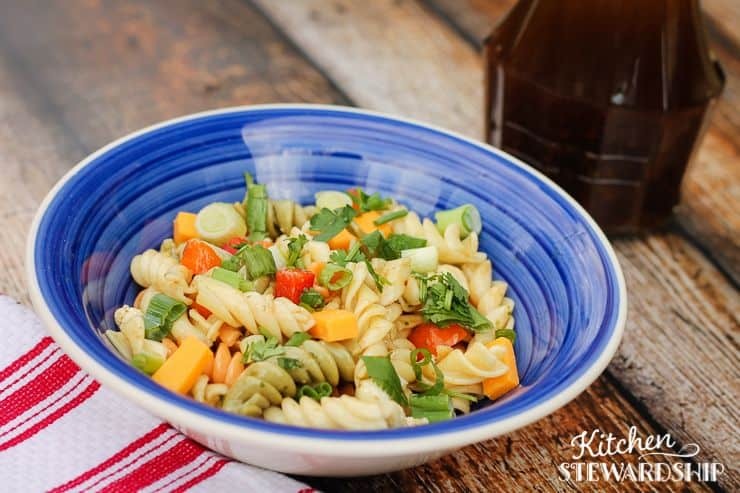 At least an hour, or better yet, a full day before making the pasta, mix up all the dressing ingredients and allow the flavors from the dehydrated veggies to infuse into the oil. I dehydrated summer vegetables at home, and they last for over a year when fully dried. If you don’t have anything like that available, the dressing will still be tasty (or try a jar of sun-dried tomatoes from the store). 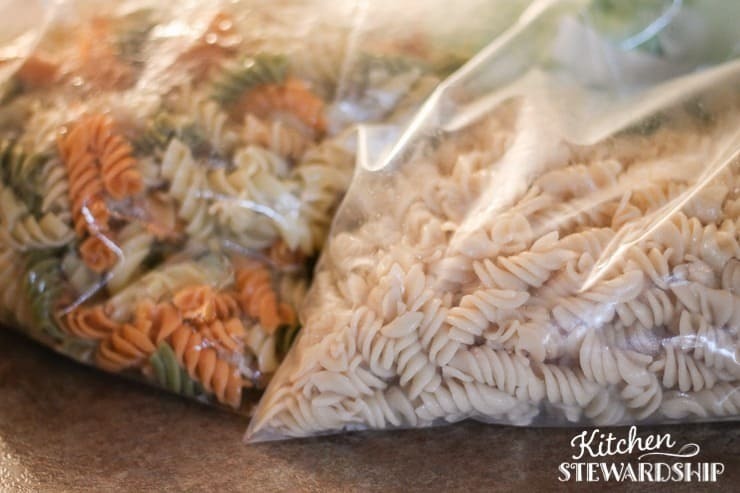 Cook pasta in salted water about 1-2 minutes less than the package directions. Al dente is better for a cold salad, especially with gluten-free pasta (this is the brand pictured). Taste a piece to make sure it’s soft enough. Rinse with hot water and pour the dressing on (minus the dehydrated peppers and tomato, although you could chop and add those if you wanted to). The warm pasta will soak up the oil and combat the crumbliness, staying pliable for days in the refrigerator. This is especially important for gluten-free pasta (You may even want double the dressing because the pasta will soak up so much.). Chop peppers into 1″ chunks and red onion into 1/2 cm. dices or thin strips if you prefer. Coarsely chop spinach and broccoli. Cut cheese into 1/2″ cubes. 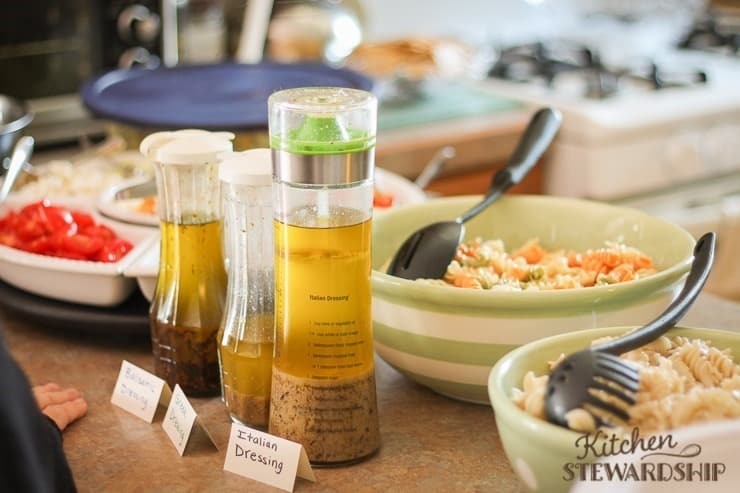 Mix thoroughly, adding additional dressing (or just oil) if necessary and chill until serving time. 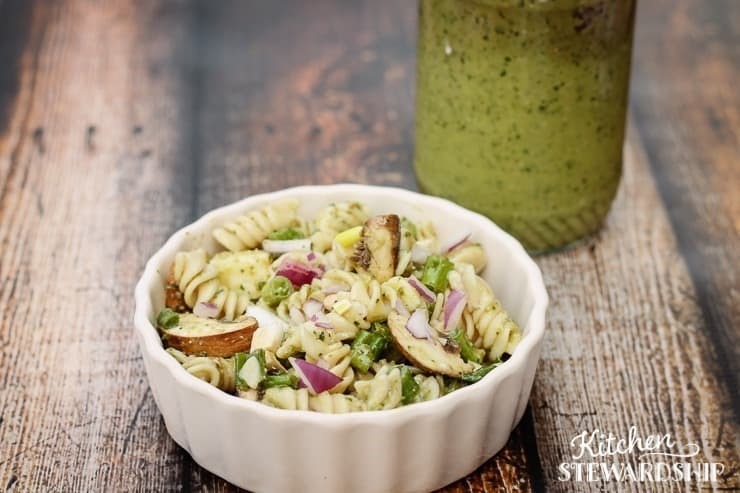 You still might need to add a bit more dressing (or just oil) when you serve it if the pasta salad sits for a while, just to keep it moist. * Pizza seasoning differs from Italian seasoning just a little. The one I have includes onion powder, bell peppers, fennel, oregano, garlic, basil, chilies, parsley, thyme, marjoram, and celery flakes. A good substitute might be Italian seasoning with a bit of ground fennel and garlic powder. I think that would cover the main flavors. * I even added a bit more seasoning blend right on the pasta. * Don’t skip the salt! Commercially produced dressings typically have quite a bit of salt, and it makes a big difference. * Remember that you can use just about any veggie you have on hand, switch out the cheese, and even try different seasonings in the dressing to make totally new variations for every party you attend. * To make it a “pizza pasta salad,” add pepperoni, and consider bacon and green olives. Yum! 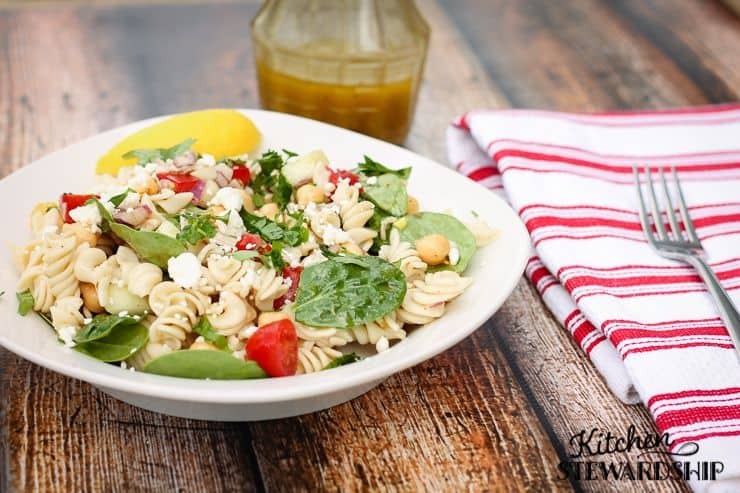 * Feta is a nice touch on top of each serving, and then you can call it Greek pasta salad, maybe with chickpeas too. If you’re thrown off by all the options in the recipes because you’re used to just ticking down a list and getting it done, you may enjoy the tutorials in Better Than a Box, which are designed to help you stretch your boundaries in the kitchen and get creative with your own recipes. 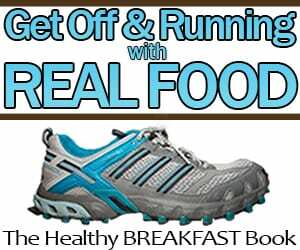 How do you cook real food for a crowd? Will you use this idea for your summer gatherings? Last week, I made a vat (and I mean a vat) of black beans with sourdough tortillas and a huge salad. We already had kimchi in the coop, and I added some sour cream and cilantro blended up with olive oil and garlic. Yeah, it was pretty great. 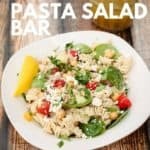 I too have to cook for about 12 people (at church once a month), and was thinking that this pasta salad bar is a great idea. Thanks, Katie!